I’m having fun collecting and then selling postcards on ebay, and learning about the history and architecture of the different scenes. The card I’m talking about today is especially fascinating. It is different from other post offices that look like the same design done over and over again. The Post Office is located at Washington and 13th St. Built in 1937 the building has fewer decorative details and a more somber look than what we normally associate with Art Deco and is known as “Depression Moderne.” Inside WPA muralist Charles Hardman painted a three-panel mural of Ponce de Leon’s invasion of Florida. The ceiling fixture that looks like the sun, and there is a fountain. All in a US Post Office! I was doing a little more research on the post office for this blog post and found there is a Post Mark Collectors Club on the internet and they not only collect the postmarks from different post offices, but visit and take a photo and learn about the history of the location. Click here for the page for Florida. A couple of the pictures show murals in other locations. The Alabama Dept of Archives and History reveals that each post office received a budget of $650-$750 to cover all the costs – materials, installation, and finally photos of the finished art. 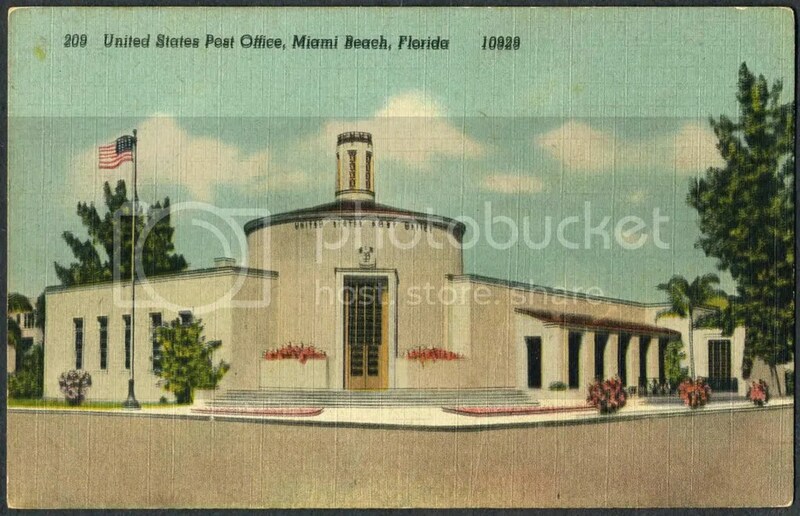 This entry was posted in postcard and tagged Add new tag, ebay, Miami Beach, Post Office, postcard. Bookmark the permalink. I guess Miami has some wonderful Art Deco buildings. It looks great!